I want to start off by saying Thank You to Shelli for asking me to be a part of her Tuesday Turndown series here on a' la mode. My name is Typhaine Peterson and you can usually find me over at Shoebox Décor where I talk about decorating small spaces on a shoestring budget. 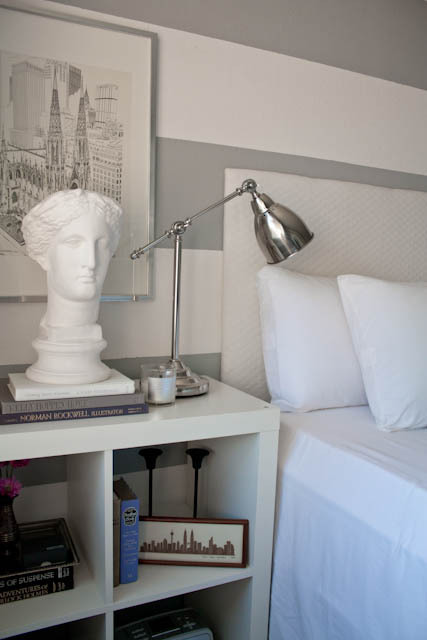 Today I’m going to share some of my favorite elements in my DIY master bedroom. 1. Right now the most precious element in my bedroom is the Kate Spade inspired dotted vase my husband I made together. It’s positioned right next to our wedding picture and it always brings a smile to my face especially when there are fresh cut flowers in it. It is also one of the first projects we did together. 2. My second favorite DIY pieces in our bedroom are the two Louis chairs that we painstakingly refinished and reupholstered. I saw the purple silhouette fabric at calico corners and I just had to have it. They turned out better than I thought they would and look fabulous flanking my vintage dresser. In the end the blood, sweat and tears were worth it because they were voted number one in the Dwell with Dignity, Ready Aim Redesign contest. 3. My third favorite item in the room is the mirror over my vanity. The pop of purple against the gray and white stripes gives it a glamorous feel. Plus I’m a firm believer that every girl needs to have a fabulous mirror while making up her face. 4. The one piece in my bedroom that is not DIY that I can’t live without is the Ikea Barometer lamp that is on my night stand. It’s an absolute must because I’m an avid reader and this lamp is perfect for late night page turning. There you have it, my do it yourself master bedroom. Thank you for reading and I hope this post inspires you to add a bit of DIY to your space…Happy Crafting Everyone! Don't forget to enter this adorable nap mat giveaway! I love the vase and stripped walls! How cute is she??? 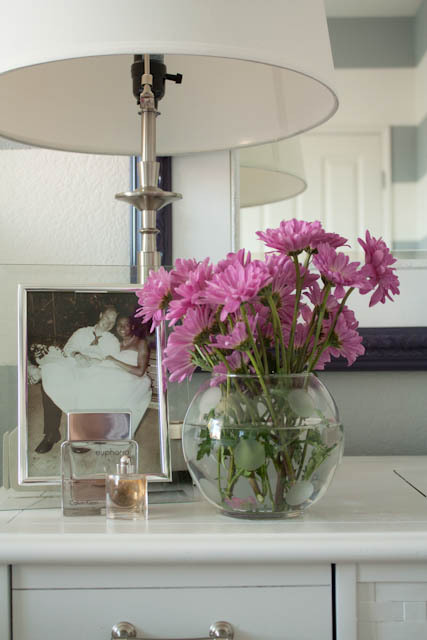 I am definitely going to have to check out her blog...if nothing else, just for the how to on the Kate Spade inspired vase, LOVE IT! Awesome bedroom! I have the Kate Spade vase and this look EXACTLY like it! Great DIY projects all around! What a beautiful room! I love the stripes on the wall. All of the accessories are so thoughtful and look great in the space. Beautiful! 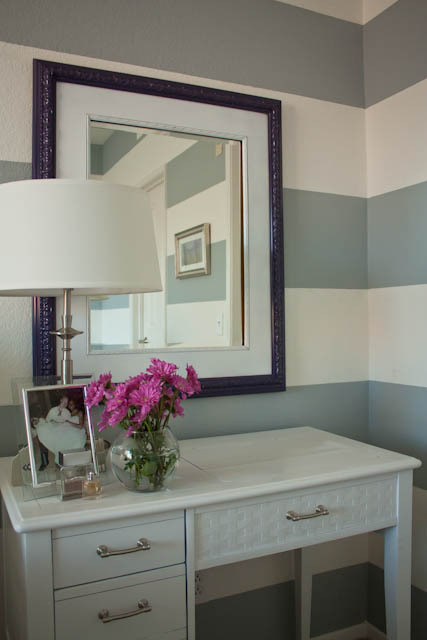 Those striped walls are fun and love her Kate Spade inspired vase! ahhh!! i'm dying over the walls, i'm so chicken to do strips all over my walls, i need the courage. But i am trying it in the bathroom! :) Love the room! totally gorgeous master bedroom! 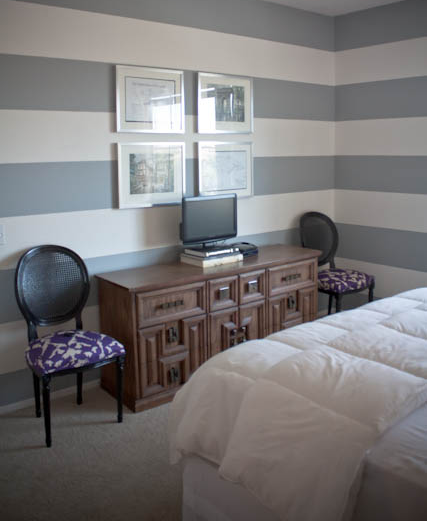 LOVE the bold stripes, the coordinating but not matching furniture, and the softness of it all! NICE JOB! Gorgeous room! How did you do that to your vase? Thanks everyone for the lovely comments on the room and thanks Shelli once again for the invite. Giveaway- Kiki Creates Print- 3 WINNERS! I Need A Paint Color- Gray? Greige? Tuesday's Turndown- Didn't I Tell You That? 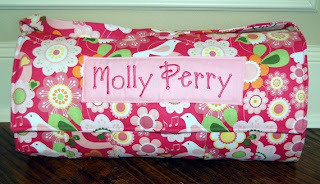 Danielle Moss Designs And A Bloggy Deal For YOU! My Boutique Lamps At Target! Giveaway- CUSTOM Nap Mat!! Precious!! Cyrus Sunburst Mirror for a STEAL! Chic Nursery In The Smallest Space! Giveaway- 2 Chevron Mini Lumbar Pillows!